What are the standard brick dimensions? 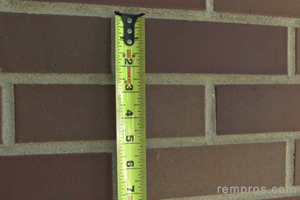 Actual dimensions will be determined by manufacturer standards and shape of a brick. Rectangle brick measured by width, height (thickness) and length is the one of the most widely used option. In masonry industry nominal size or exact brick length and height plus the thickness of a joint use for calculating the number of bricks require to build a certain object. While nominal dimensions will work with a high accuracy for simple single standard layout, more complex work as well as custom design will require precise calculations with analyzing all parameters and exact brick specifications, otherwise decreasing of an accuracy might take a place. Actual brick dimensions, thickness of the joint and number of rows should be included while calculating the number of bricks required for building a wall. While in theory the amount, size and thickness are precise characteristics, in practice there is always tolerance and acceptable allowances when it comes to load bearing masonry. Based on the type of mortar (cement), bricks used and type of a structure thickness of joints should stay within certain parameters and determined by building codes. Some bricks are modular when length (L) and width (W) stay in proportions to each other – typically 1L equal 2W plus thickness of joint. Some does not have any proportional relationship between width and length. First row for each size marked in bold is dimensions of a brick in imperial units (feet, square feet), second in metric system (millimeters, square millimeters). H – brick height; W – brick width; L – brick length; S = H x L; SJ = S + Joint thickness - 3/8”, 10 mm. N – number of bricks require for 100 square feet or 10 square meters of wall. Note: the numbers are not masonry industry standards, but only a data analysis based on most common brick sizes. Usually solid 2 1/4 x 3 1/2 x 7 5/8 brick will weigh about 5 lb with proportional changes according to its dimension.